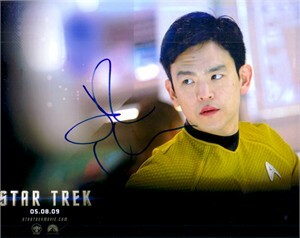 Star Trek promotional 8x10 photo autographed in blue marker by actor John Cho, who played Sulu. Obtained in person. With certificate of authenticity from AutographsForSale.com. ONLY ONE OF THIS POSE AVAILABLE FOR SALE.